Bird Central - Bat House Kit / Bat Box Kit - Bird House Kits / Birdhouse Kits - various bird house kits, including an eastern bluebird bird house kit and a bat house kit, too! This top selling bat house features a single chamber which will hold up to 20 bats. 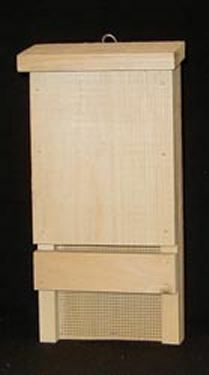 Similar in design to the Bat House Batchelor Pad Bat Box, but smaller. Features an extended landing pad and an interior covered with screening to provide bats with a maximum foothold. Also includes echolocation slot to help the bats locate the cavity. Designed to be an educational tool for youngsters, and adults alike. It comes with easy-to-follow instructions and information about bats.